I read Alice Peterson for the first time, when I picked up this book from the library. I had loved it as you can see from the review. 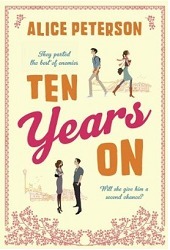 I ended up following Alice on Twitter and was delighted to find out that her book ‘Ten Years On’ was on a discount on Kindle. Cheap as I am, I couldn’t let that go! Rebecca is happily married to Olly. Living a comfortable life in London, with Olly working as a teacher while trying to write his script and Becca, working in a art gallery with a lovely boss. Life is perfect. It only takes a moment for that to change. 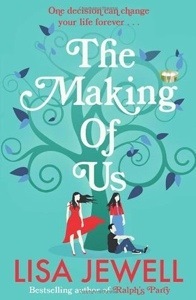 When tragedy hits, Becca is forced to move back into the little village that she grew up in, and live with her parents. Grieving and hit with another change in her circumstances, Becca’s life has changed more than she could ever imagine. Becca ends up meeting Joe, an old friend of Olly’s and her’s. They had been in university together and had been the best of friends but had lost contact over the years. It was ten years since they had lost touch with Joe. Reconnecting with Joe brought back memories for Becca, which she had kept buried. As she struggles with the cards that life dealt her, she is faced with a second chance at happiness, if only she could be brave enough to grab it. That’s about all I can say about the book without giving away the plot. An absolutely lovely read. A book about love, loss and second chances. Becca and Olly’s relationship is beautifully portrayed and so are all the other relationships. Becca’s relationship with her parents and sister, her friendship with Joe. Her feelings and the turmoil that she goes through. It feels real, it’s not the perfect, ‘there-is-not-one-thing-wrong’ kind of relationship, but a normal relationship between two caring partners, who came with their baggage, frustrations and issues. I loved the way Peterson crafts her characters. As I said before, the characters are all real, the situations are those that we can identify with. It’s a perfect book to curl up with, just keep the tissues handy. Peterson also manages to keep a little bit of mystery about what happened ten years ago, and that makes it a completely engrossing read. I would give it a 4/5 easily. Call me a shallow reader, but I do love some authors like Diane Chamberlain and Dorothy Koomson. There is something about their books that appeal to me. And when I love an author’s works, I end up picking up their works again and again. Janine has just sent her eight year old daughter, Sophie on a Brownie Camping Trip. A big enough event for most parents, but it has even bigger implications for Janine as Sophie, has never been on a trip like this before. Sophie is a very ill child, with a Kidney disease that has no known cure. She has been severely ill and used to need dialysis on a daily basis until Janine put her on an experimental treatment that met with severe opposition from both Janine’s parents and her ex-husband, Joe. That this treatment seems to have helped Sophie cuts no ice with Joe or her parents who are not comfortable with the fact that Janine has chosen an alternative treatment which nobody else has ever heard about. Even worse is the fact that it was Lucas, a gardener who introduced Janine to this alternative treatment. Now, in addition to the treatment, Janine also took the decision of allowing Sophie on a trip away from home. Janine only wanted Sophie to live like the little girl she is, but for both her parents and Joe, it is an unthinkable option – sending an ill child to a camp! Janine goes to pick Sophie up, from the pick up place, only to find Sophie missing. Things are bad enough when a normal child goes missing, but for Sophie, things are much more dangerous. She could die if she does not have access to treatment. Janine is desperate, she needs to find Sophie, and she needs to find her fast. She refuses to believe that Sophie is dead. Janine has to search and find her precious daughter before it is too late. Just as Janine is struggling to find and rescue her daughter, there is another mother who is trying hard to save her own daughter, even if it means that another mother’s daughter must die for her daughter’s safety. Would she be big enough to think of someone other than her own daughter? A story that is guaranteed to tug at your heart-strings. Janine’s vulnerability and her strength are both beautifully brought out. 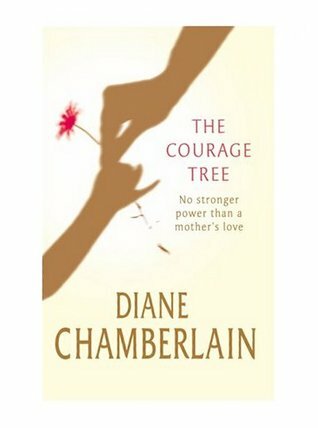 The dilemma that Janine faces, the uncertainty of the choices that face her, and the way she faces the situation that confronts her.. It’s a beautiful book, another Diane Chamberlain book that is un-put-downable. Absolutely engaging and completely gripping, till the very end. A book I raced through, because I couldn’t not know what was coming. Completely worth the read it was too. A book I would definitely recommend if you like books of this sort. A 4/5 read for me. Award-winning author Diane Chamberlain, was born and raised in Plainfield, New Jersey, and attended Glassboro State University. She also lived for many years in both San Diego and northern Virginia, where she still resides. She is an author of 22 novels. She usually writes about relationships between men and women, parents and children, brothers and sisters, and friends.